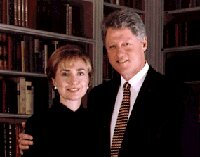 "We can't be so fixated on our desire to preserve the rights of ordinary Americans ..."
Bill and wife Hillary were earmarked for the White House with their destiny as New Age, one-world co-presidents of the United States, to lead us across the bridge out of our Constitutional freedoms and into a New World Order. Bill Clinton began his reign in office cloaked in a exaggerated economic crisis, promising a financially beleaguered populace to bring change to the economy. Beginning from the very outset his social programs promised to sink America into even deeper moral decadence. And as his second term in office proved, he incrementally sold out this countries sovereignty to a foreign interests. At his acceptance speech, President Clinton singled out Dr. Carroll Quigley as being one whom helped to form his political outlook. Quigley was a liberal academic with a very identifiable world view. Quigley is known principally for his 1,338 page tome called Tragedy and Hope: A History of the World in Our Times originally published in 1966. Quigley wrote approvingly of the power, influence and activities of what he called "the network" that tries to rule the Western world. The "network" always prefers Big Government, big federal spending, and the stability of a planned society rather than the uncertainties of the free market. One example of the power of the network is the way it has forced the American taxpayers to spend some $10 billion a year on foreign giveaways every year since World War II. Quigley described the Council on Foreign Relations as one of several "front" organizations set up by the network for the purpose of advancing its internationalist schemes. He boasted: "I know of the operations of this network because I have studied it for 20 years and was permitted for two years, in the early 1960s, to examine its papers and secret records." Quigley asserted that he was personally acquainted with the dynastic families of the super-rich, and he traced their immense power and influence. For the most part, he was a fan of their goals and policies and said that his chief difference with the "network" was that "it wishes to remain unknown, and I believe its role in history is significant enough to be known." The "Hope" in his book's title represented the collectivist one-world society that will exist when the "network" achieves its goal of consolidating its rule. All who resist this man-made millennium represent the "Tragedy," and Quigley asserted that it was too late for ordinary people to fight it. 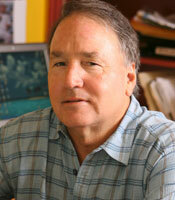 The economic comrade of Clinton's who, though appointed to no official post, helped form his economic strategy is Derek Shearer, longtime associate fellow at the Institute for Policy Studies, "which is committed to socialism in America and sides with the Soviet Union on almost every important foreign policy issue," according to a 1988 article in Policy Review. Shearer favors socialism, but don't look for the words communist or socialism to show up any time soon in Clinton's speeches. In the book Economic Democracy , written with Martin Cornoy, Shearer says corporations are too "impersonal and powerful" and that a strategy to achieve economic democracy "must start by dismantling, or at least restricting, the power of these corporations." Shearer and Carnoy call for a "democratically" planned economy - one planned by government bureaucrats. They also call for nothing less than complete government control of capital markets. "A strategy of reform," they write, "must transfer capital from the corporations to the public.... The logical vehicle for that process should be the government." The objective, according to the book, is to provide a vehicle for governmental takeovers of entire industries "without the immediate financial and ideological burdens that large-scale nationalization efforts would entail." This has been attempted with the Clinton Health Care plans and government intervention into the tobacco industry and continues to be attempted with ObamaCare. It was also later a central message of the Occupy WallStreet movement in 2011. Certainly, the bulk of Americans who voted for Clinton/Gore never envisioned the global socialist state that they and those who dictate policy to them would institute and are now continuing to build. But, then again, those same voters have proven they don't care anymore. The price we paid was that now America had an administration with an openly socialist agenda. Following the events of Sept. 11, 2001 Americans have been distracted by the government and the media into formulating a new enemy of our freedom. The corporate controlled news media has been complicit with the federal government in creating an illusion designed to win over most Americans. We are told, for example, that militant Islam has the goal of destroying freedom as we know it because they hate us and goes by the names, Jihad, Hamas, terrorist, insurgent, Saddam Hussein, Al-Qaeda, bin Laden, al-Zawahiri, etc. While those may indeed be enemies to our freedom... there is an even more sinister enemy at work within our borders intent on destroying our Constitution and eliminating the civil liberties of Americans and the redefining of justice. It's called: the Progressive Caucus, Homeland Security, multiculturalism, Hillary Clinton's "village", and has names like Ted Kennedy, Charles Rangel, Jesse Jackson, Sarah Brady, Bill Clinton, and Barack Obama, among others. It is Socialism and it's quickly spreading throughout America. In this 21st Century new world order the individual loses all rights and everything is done in the name of the commonwealth (public) (read - "village"). You are officially the property of the state and not an individual with wants, desires, and needs. There is only the rich and the commonwealth. If you are not rich, then you are a member of the commonwealth. The needs and wants of the rich come before the needs and wants of the commonwealth. In the commonwealth there are no individuals and no one has any rights whatsoever. All decisions in your behalf are made by the state. Your children are the property of the state and it is decided by the state what they will learn, who will teach them, and what will become of them. As a parent, you have little or no say in what becomes of your children, all decisions are made by the government and you accept or become an enemy of the state. In the Clinton vision for 21st Century America, the government owns and/or controls the basic means of production and distribution of services and goods. We are told that business and other things will be regulated but that we will still be free. Free to do what? They will operate under the illusion of a free enterprise system. All business and land, if not owned by the government or the rich, is controlled and taxed very heavily. What a contradiction of terms. How can anyone have a Socialist form of government with freedom? As stated, in a Socialist form of government the rich rule and have the power, not the people. Already, we've seen the actions the government has taken in recent years concerning tobacco, health care, the environment, the airline industry, the auto industry, and the financial industry. Vice President Al Gore promised to make air travel safer and with that, Americans were eager to accept the further erosion of their liberties and paid even higher tarifs to government to protect them from an unseen enemy. One lady I recently travelled with told me that she was willing to undergo an extensive selective search of her luggage "if it would make traveling safer." Safer than what? I ask. The Clinton administration took full advantage of the crash of TWA 800 to play on the fears of American travellers. It would seem a foregone conclusion that the airplane was brought down by a terrorist act - regardless of the fact there is no conclusive evidence to date that it was a criminal act. The events of 9/11 only cemented the governments reach into the transportation industry. This heightened state of security at American airports is nothing more than another ploy of the government to further control the airline business, dominate and control the American public, and raise another "hidden" tax to pay for it. The creation of a federal (Homeland Security & FEMA) or state police force; the purpose of which is to put down disturbances, political or otherwise, "root" out political enemies, ensure the loyalty of the people, and enforce laws upon taxation, population control, religion, the workplace, and the family unit. Laws are now being created which make Americans that dissent to be labeled "terrorist" and bringing the full force of the state police force against American citizens. The subjection or elimination of all religious institutions, with the exception of a state approved and mandated religion. This "New World Order" institution will also be used to ensure the loyalty of the people and will be used in the collection of taxes. The Scriptures clearly state that "Blessed is the nation whose God is the Lord." (Psalm 33:12). The nation who honors the one true Jehovah God will experience His blessings of protection, provision, peace, and stability. America has forsaken God and as a result we can see in our families, our schools, the inner-cities, our government, indeed in all areas of our lives, the removal of Gods blessing. The demise of morality, the loss of our freedom, the crime in our streets, the poverty in the inner-cities, the war zones in our homes and the violence of our children is Bill Clinton's legacy and will not improve until we understand the days we are living. Contrary to liberal propaganda, we don't have an economic problem, we have a problem of our spirit. We have willfully and systematically rejected God and as a result, we are now experiencing the fruit of that sin. The Socialist State cultivated by the Clinton presidency obviously presents a clear and present danger to the traditional American way of life that has been grounded in Judeo-Christian principles. But a much greater danger is on the horizon. This danger is the socialistic serpentine worldwide government that the Scriptures say will emerge in the end times (Rev. 13:7-8). This New World Order empire, based in a reunified Europe, will abrogate the sovereignty of every other nation on the face of the earth. Its government will be run by godless, amoral Humanists who will worship the creation rather than the Creator (Romans. 1:25).